The water vole, famously known as ratty in Kenneth Grahame’s Wind in the Willows, is now extinct in Devon and Cornwall, though there are populations just across the border in Dorset and Somerset. The Otter Valley Association is now participating in a project whose aim is to encourage the natural re-colonisation of the rivers Axe and Otter. The accidental release of mink from mink farms has been a prime cause of the demise of water voles in Devon. A ban on mink farming was introduced in January, 2003. A single adult mink can patrol about a mile of riverbank and will eliminate the water vole population from that stretch. The mink are voracious, agile predators and are the enemies of many species of small mammals and birds that live on the riverbanks. However, there are indications that the wild mink population has recently been severely curtailed from significant stretches of the Axe and the Otter, possibly because of competition with otters and by the capture and destruction of mink by trapping. So-called “mink rafts” are used to monitor the mink population (and other small mammals) and traps are then set in places where mink have been detected. We are participating in the Devon Water Vole Recovery Project by assisting Mervyn Newman, East Devon District Council’s water vole officer, in his monitoring programme. Mr Newman has provided us with mink rafts and training in how to use them. Volunteers from the Natural Environment Committee spend a few hours each month checking and recording activities of mink, otters and water rats. 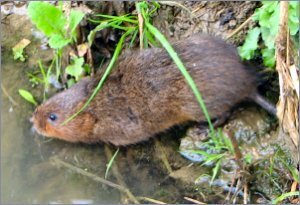 The information that we obtain should be helpful in assessing the prospects for a successful re-introduction of water voles to the River Otter.